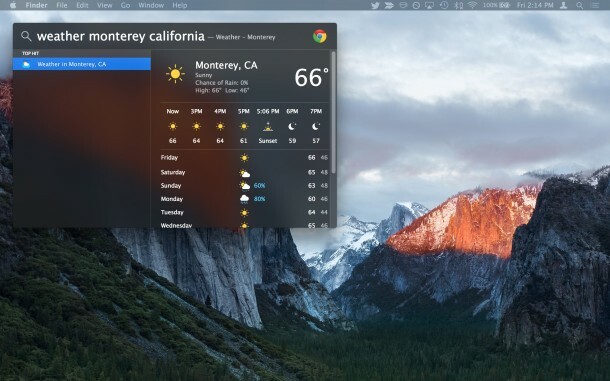 The Spotlight search window can be moved around screen in modern versions of Mac OS X, which is great if you want to move the Spotlight window away from something that it’s obstructing, or perhaps because you’d rather it be in the corner of the display then in the middle of the Mac screen. Moving the Spotlight Search window is simple, simply summon Spotlight as usual through the menu bar item or Command+Spacebar shortcut, then click and hold on the Spotlight window and drag it to your desired location. You can move Spotlight anywhere on screen, whether the search field is populated or not. You can even tuck the Spotlight search window into the upper right corner of the display to mimic the appearance of earlier versions of Spotlight in MacOS X. Moved the Spotlight window off screen and can’t access it? Or maybe you just want the Spotlight search field to be perfectly centered again? No sweat, just click and hold on the Spotlight icon in the menu bar of Mac OS X to re-center the spotlight window exactly back into the top middle of the screen again, at it’s original default location. Heads up to LifeHacker for the centering trick. To be able to move Spotlight around you’ll need macOS or OS X 10.11 or later on the Mac, earlier versions do not allow the window or search field to move. 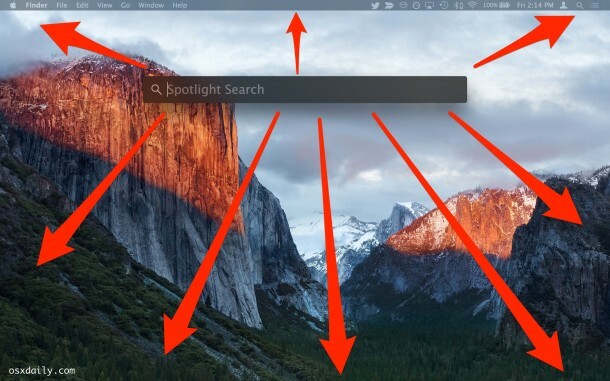 Want to learn more about Spotlight searching for OS X and iOS? 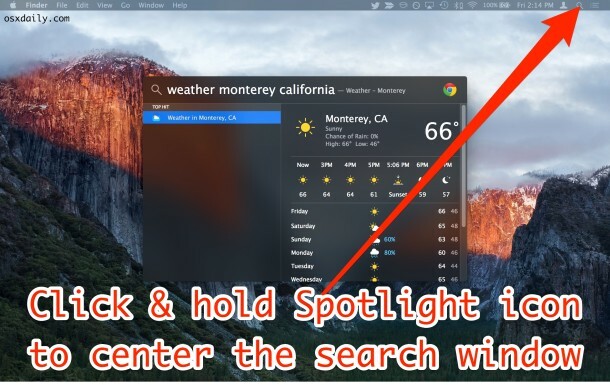 Check out other Spotlight search tips or learn some of the nifty Spotlight search tricks new in modern versions of Mac OS X. Maybe I’m a bit of a perfectionist. Speaking of being a perfectionist, window snapping in Sierra is awesome, I don’t know why no one really mentioned it. It’s super cool and useful!